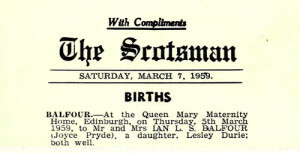 1959, and exciting news for the Balfours as baby Lesley is born at 10pm on the 5th March, weighing 8lbs 15.5oz. The family were inundated with letters and messages of support, some of which can be seen on the diary PDF. They celebrated their first anniversary with a holiday to Grantown-On-Spey. Other highlights include family photos, the General Election, the building of the Forth Road Bridge (which was underway) and a new Bo’ness Hill Climb record. by downloading the PDF below.